Dr. Don Prasad earned a double Bachelor in Commerce from University of Illinois, Chicago and Bachelor in Commerce (with Merit) from Curtin University. Thereafter, he finished both his Post-Graduate Diploma in Business and Master of Commerce (with Merit) from Curtin University. He then completed his Ph.D. in Global Business Management (with Merit) from the University of Costa Rica. He has worked for and been a consultant with several Multinational Corporations and SMEs in Australia, USA and Asia prior to joining academia. He has taught in the area of marketing for well-known accredited universities in Asia, Europe and Australia. Dr. Prasad has also been a nominated member of several research publications like the Business Intelligence Journal and European Journal of Marketing. Over the last 18 years, he has published several academic papers. He is a member and fellow with various prestigious professional bodies, Chartered Institute of Marketing (UK), Cambridge Academy of Management (UK), Institute of Management Specialists (UK) and sits on the Board of various international organizations. Dr. Leopoldo A. Valdez is the concurrent Dean of the Graduate School of Management and the School of Business and Accountancy. At the same time, he is General Manager of the Valdez & Associates, an accounting and management consulting firm; and Director of Valdez Institute of Professional Service Providers, Inc. (VIPSPI). External Cooperative Auditor accredited by the Cooperative Development Authority. External Corporate Auditor accredited by the Securities and Exchange Commission. Dr. Valdez has had extensive experiences as bank manager and auditor in private and government commercial and rural banks. For over 30 years, he has been involved in Cooperative Development, Corporate Management, Public Administration and Higher Education in northeast Philippines for which he has generated numerous researches, training modules and doctoral dissertations. He finished his Doctoral degrees in Education and Public Administration from Saint Mary's University and has been variously trained by the University of the Philippines, Ateneo de Manila University and Saint Louis University. Dr. Prescilla Esperanza A. Soriano is the second President of Aldersgate College, Inc.
Dr. Junifen F. Gauuan has served as President of Aldersgate College, Inc. since 1982. He finished his Bachelor of Science in Business Economics (with Merit) and M.B.A. degrees from the University of the Philippines. He graduated Ph.D. in Development Administration from Philippine Christian University. He had been a National State Scholar, UNIVAC Summer Scholar, a recipient of AIDAB Fellowship for Rural and Environmental Development at Macquarie University in Australia and the FAPE-UNICEF Fellowship for Higher Education Management in Asia at SEAMEO-INNOTECH. Dr. Gauuan has extensive management, research and development experiences in the fields of business, governance, education, health, information system, rural marketing and finance, agro-forestry and environment. He also has significant program and resource linkages with government and non-government organizations and agencies locally and abroad. He is a well-known figure in the public and private sectors for his involvement in innovative social, economic, educational development projects. 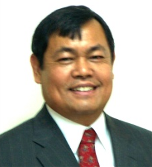 Dr. Gauuan also served in the Boards of many government and non-profit agencies, organizations and associations.